I'm kind of bummed. I just realized how close Easter is to St. Patrick's Day this year. I've been debating on if it's even worth it to drag all of my Easter decorations out of storage for less than 2 weeks of display. I'm not even sure if Mariah is even going to be able to come home from college that weekend to enjoy dinner with us, so I guess I'm feeling a bit blah about Easter this year. She will be coming home this Saturday for spring break though, which means she'll be here for St. Patrick's Day, so hurray to that. She still looks forward to playing our annual "find the four leaf clover game" even though she's technically an adult now. I suppose one is never too old for kids games when you get a sweet reward for participating, right? 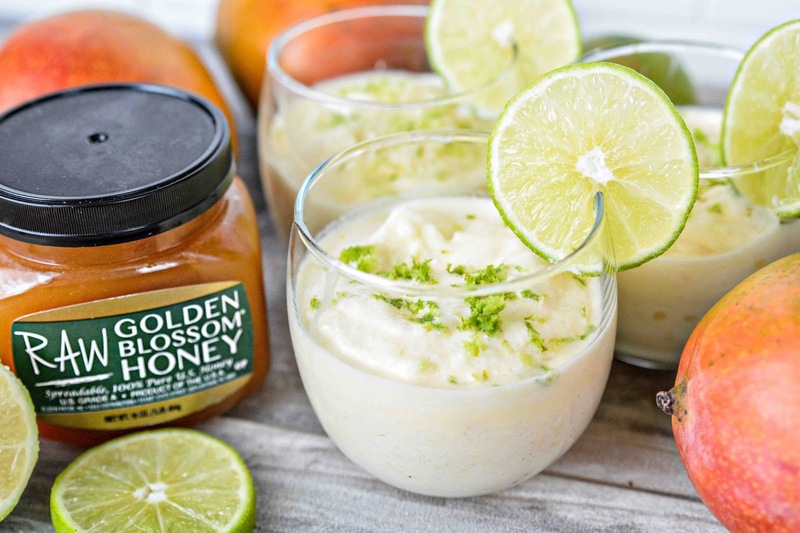 In addition to their pots of gold for finding the clovers this year, I'm going to sweeten the prize pool with these Refreshing Mango Freezes from Golden Blossom Honey. Since my girls aren't into the traditional St. Patrick's Day meal of corned beef and cabbage, I thought they should still get a little green into their bellies with something they would actually enjoy, so these Mango Freezes will be a perfect addition to our festivities. I like that this dessert is not only easy to make, but healthy as well. I think replacing the milk with vanilla almond milk would be a great alternative to those who don't do dairy and would add even more sweetness to this yummy treat. Are you putting up St. Patrick's Day or Easter decorations this year? Why isn't it orange colour, dear? I thought mango was like a peach inside, but I did eat one years ago. When is Easter this year? I'm totally out of touch with dates. I think the white of the milk + the green lime tone down the orange color quite a bit. There are specks of orange in the glass when you see it in person, it just didn't show on the photo very well. Oh, I must stick something to your Facebook profile today! When you get a reward, all, almost, games are fun. At least it's not as soon as some years. Some years easter came a week after or there abouts. But I'm not complaining as I get days off. As long as you get the days off, it's all good! I can't wait to make this! I love the flavors here. It's really just home made, no-churn soft-serve. Yummo! Exactly! Just freeze, blend and go! 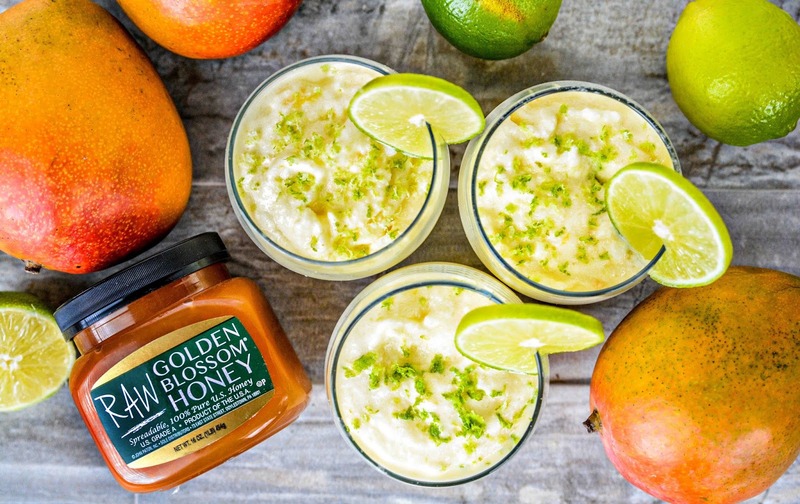 This seems like a great drink and with the honey and mango it makes it healthy. I am just waiting for spring and warmer weather so happy holidays whenever they come up. Sounds refreshing. I love my water, but I need a change from that at times. I don't decorate for St. Patty's day. It looks fun to do though. Same here. Water all day, but sometimes a little extra treat is nice. This is perfect for the warmer weather as well. It's such a refreshing drink and I just really love mangoes. Thanks for this! We'll definitely be making this again this summer! That is an awesome prize. I love that they use mangoes! My daughter is on Spring Break now too. So am I, woot!!! My new favorite holiday, hahaha. Love that refreshing drink. Mangoes are hard to come by in the area where I live so I get a big bag of them when I see them in the supermarket. I am saving your recipe and will make it once I have some of those golden tropical fruits in my kitchen. That sounds so refreshing! I love everything mango. It makes me feel like I'm on vacation! Really delicious Theresa! I love mangoes !! This looks very refreshing indeed!! Looks like something perfect for this spring and summer! Love mangoes so much, Theresa...we have tons of them back home! Happy St Pat's Day and have a wonderful weekend with your family! You must miss her so much! !